When we reviewed the Nokia 808 PureView a lot of our time was spent on the camera. Now that the review is done, we’ve had time to test out the battery – it’s a fine balance between Symbian’s low requirements and the relatively small 1400mAh battery. The 808 PureView is far from the most compact phone around, so it’s natural to think that Nokia could have fit a bigger battery. But maybe they didn’t need to, find out after the jump. As usual, we begin with our talk time test. The official talk time in 3G is 6 hours and 50 minutes though we only managed to squeeze out 5 hours and 16 minutes. Neither result would have put the 808 very high up on our chart but we’ve seen worse performers. Side note: since the result charts were getting pretty long, we made them show only a few results by default (the best and worst ones, plus a few results close to that of the phone in question). You can hit the Expand button to view all phones. Next up is web browsing – always an issue with phones that use AMOLED screens since those consume the most power when they display a white image, which is the case with most webbsites. The Nokia 808 PureView lasted 4 hours and 14 minutes of browsing over Wi-Fi. That’s comparable to the Samsung Galaxy S II and HTC One S, which have slightly bigger AMOLED screens (4.3″), but also slightly bigger batteries (1650mAh). Watching videos would probably be a common use case for the 808 PureView – videos you’ve shot yourself or otherwise. With 9 hours and 53 minutes of constant video playback, the Nokia is one of the best performers in this test. 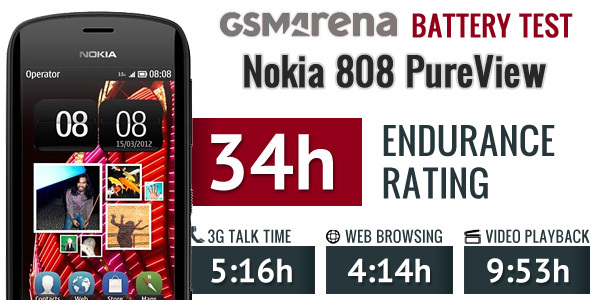 The final endurance rating for the Nokia 808 PureView is 34 hours. That rating indicates how long the phone will last if you do an hour of 3G calls, an hour of browsing and watch videos for an hour each day. 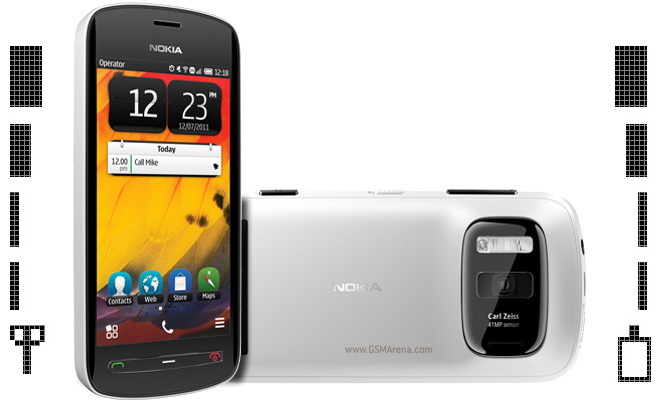 The Nokia 808 PureView holds its own against a lot of current Android phones. Talk time could have been higher, but the phone should last you a whole day even with heavier usage.